Hi, recently I've getting a problem with the flashplayer when I'm using opera. I've it installed and it works fine in others browsers, but opera just doesn't dettect it. Someone can help me? Thanks. Flash won't work with Opera, sorry, that's just how it is. 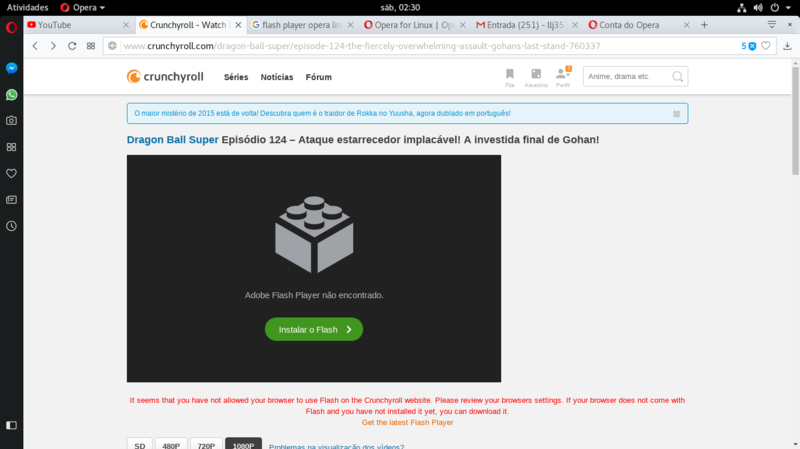 Use a different browser if you have to watch something with Flash. @scottalan Flash works in Opera Linux for me. Before I start analysing why flash on the main debian repo is crap on many aspects, I have to ask: how did you install flash on debian and which package did you install? I have the exact same issue on Linux Mint 18.3, Opera 50.0.2762.67. Things were fine until a few days ago, then videos stopped working properly. Firefox and Chrome are not affected.